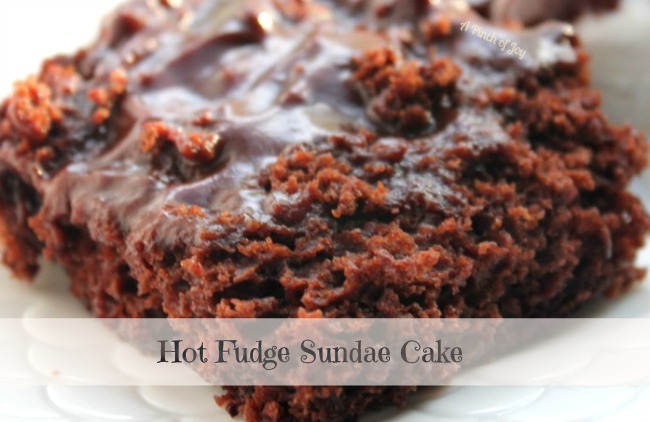 Apple Valley Sue sent this recipe saying “This Hot Fudge Cake is the best recipe. You can make it in 10 minutes. Put it in the oven right just before you are ready to serve the meal and you have a hot, delicious dessert.” I did and it was! Thank you for sharing! Being curious and of questioning mind, I actually made this several different ways. Maybe the second time was because the first time my curious mind did not register the correct size of pan – which Sue clearly stated in her email. Be sure to use a square 9 x 9 pan. Just sayin’. The recipe as written will turn out fudgy, sundae saucy and yummy! I really was curious as to how this could make the fudge sauce under the brownie. The secret is the sugar. Sugar is not just a sweetener. It is a hardworking part of the complex reactions that take place in baked goods. In this recipe, sugar’s primary role is to attract moisture. The brown sugar on top attracts even more moisture than white sugar, besides giving a more robust flavor. As the saucy cake bakes the layers begin to build, with the heavier moisture laden sauce layer collecting on the bottom of the pan and the lighter cake layer coming together on top. Just to see what happened, I made it again and reduced the amount of sugar in each layer by one quarter cup and was rewarded with pudding on the bottom instead of sauce. Good, but no comparison to the original.Sue says to let the cake cool for 15 minutes, then cut the cake into squares. Serve warm. Scoop of ice cream optional. This recipe was featured at Miz Helen’s Country Cottage, RoCa and Company, Thank you! Hot Fudge Lava Cake takes about 10 minutes to mix. Bake in the oven while eating and you will have a hot, fudgy, delicious dessert ready to serve! Mix together in measuring cup, then pour over dry ingredients and mix well. Pour evenly over the entire cake and topping. DO NOT MIX! Cut into squares and invert each on to plate. Serve with ice cream topped with the sauce scooped from the bottom of the pan. Your recipe is featured on Full Plate Thursday this week. Hope you are having a great day and enjoy your new Red Plate. I love quick and easy desserts. Thank you so much for sharing at Taking A Timeout Thursday this past week. I hope to see you again tomorrow! This is a wonderful dessert that we will really enjoy. I can’t wait to make it.Thank you so much for sharing with Full Plate Thursday. Hope you are having a great day and come back soon!